Tempest 2000 designer Jeff Minter wants to release his latest tube-centric shooter, TxK, on a bunch of platforms, but the longtime designer is saying Atari won't let him do that. Let's just say Minter doesn't have many kind things to say about his former employer. Minter didn't create Tempest—that was Dave Theurer—but jumped on board with Tempest 2000. He's been iterating on the concept for decades now, in Tempest and non-Tempest forms. TxK is simply the latest installment. TxK was released on the Vita more than a year ago, but Minter had plans to release on other platforms. Minter disclosed his hostile interactions with Atari on Twitter this morning, and claimed the upcoming versions of TxK had essentially been cancelled due to legal threats from Atari. In a post on his website, Minter revealed he'd been going back-and-forth with Atari for a while. "This has been going on behind the scenes for a while now. I'd kept it on the down low all this time because I had hoped we could maybe work something out, maybe "Atari" would commission an officially licensed version from us; we made it clear we'd be willing to negotiate about that sort of thing." In fact, Atari had apparently made threats regarding the Vita version of TxK, telling Minter he could not have created TxK without access to the Tempest 2000 source code. Of course, as Minter points out, he wrote the Tempest 2000 source code, so he might not have needed access. "I think they thought I was somehow making loads and loads of money on the Vita version of TxK, I guess because it did garner excellent reviews and a bit of positive press. But the Vita isn't a massive market, TxK made back it's development advance and a bit more and that was it. They kept hassling us and eventually I sent them sales statements so that they could see for themselves that we weren't getting super rich out of it. I even tried to point out that if there was any serious money to be made out of it it would likely be from the ports we were making, and that we were willing to negotiate about obtaining "official" branding for, if it meant they could at least be released, but we were met with nothing more than intransigence." According to Minter, Atari wants him to sign a document banning future ports of TxK. Given how he's now gone public, it seems like he's hoping to have Atari reconsider its stance. Towards the end of his post, Minter disclosed a conversation between himself and the programmer of Tempest 2000 for the original PlayStation, which was renamed Tempest X. Minter had designed Tempest 2000, but didn't work on the port. Minter alleges Atari changed the game's design just enough to change the amount of royalties Minter was due for the game. "Wouldn't it be nice if there were actually some kind of precedent set that determined how different a game had to be to be considered a different game legally? Well, it just so happens there is, and it involves Tempest 2000 and Atari! Do you remember there was a Playstation port of Tempest 2000 called Tempest X? I always wondered why the name was changed, and other little aspects of the gameplay were altered. years later I managed to chat online with the guy who did the port, and he told me that the changes were made "to reduce the royalty burden". How so? Well, my original arrangement with Atari was that I was to receive a royalty on any ports of Tempest 2000. Tempest X was made exactly enough different that it would be legally considered a different game, cutting me out of any royalties." So far, we don't know Atari's side of the story. If I'm able to share anything more, I'll pass it on. Update (4:36 pm): This story is evolving, as Minter has responded to Atari's statement. "There has been *no* contact between Atari and Llamasoft. The only contact they have made with us has been through lawyers," he said over email. "We did try to approach them via a non-lawyer route (someone I knew from my time at Atari knew someone inside fake-Atari and offered to see if he could find out what the hell was going on; the internal fake-Atari contact reported back that as soon as the subject was raised he had been told forcefully to "back off" and everything left to the lawyers). I do not consider threatening letters from lawyers to be "contact with the developer" by fake-Atari. Let them speak to me face to face." Minter also forwarded one of the legal documents he received from Atari, outlining their issues. I've contacted Atari regarding Minter's response. Around and around we go. "Atari values and protects its intellectual property and expects others to respect its copyrights and trademarks. 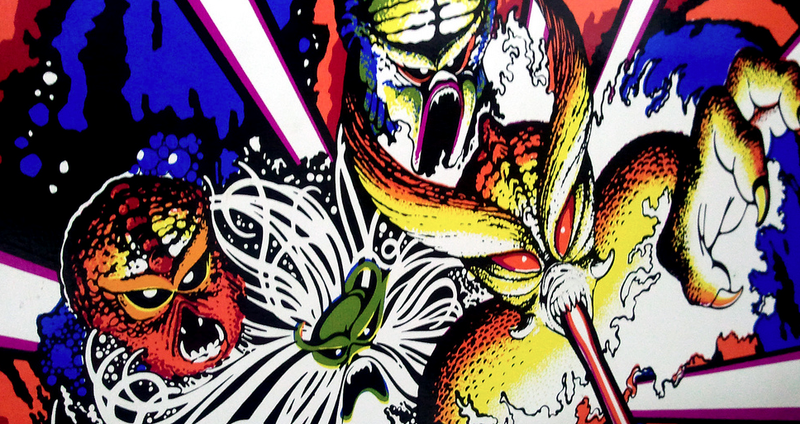 When Llamasoft launched TxK in early 2014, Atari was surprised and dismayed by the very close similarities between TxK and the Tempest franchise. Atari was not alone in noticing the incredible likeness between the titles. Several major gaming outlets also remarked at the similarity of features and overall appearance of TxK to Tempest; one stated of TxK, "This is essentially Tempest." There is no lawsuit. Atari has been in continuous contact with the developer since the game launched in hopes that the matter would be resolved." I've reached out to Jeff Minter for a response to Atari. Stay tuned, as more of this story unfolds.